A few weeks ago, some friends gathered at our house for an Italian potluck dinner. The plan was simple: everyone took one part of the menu and came up with an Italian-type dish. Italian is one of the few cuisines I never cook … but I figured I couldn’t go wrong with some basic appetizers. It turns out that Italian style appetizers are exactly that: basic. The best ones are made with ingredients that are fresh, simple and delicious. While I’d highly recommend making these in the summer months (when tomatoes and basil will be in season, inexpensive and irresistible), I’ll post them now for your eating pleasure. Just in case you can’t wait til June to get your hands on some brushetta. And, of course, when you think Italian appetizers, what do you think of? This is also very easy to make. Prep by turning the oven on to 450 and making sure you have a rack on the very top. Slice a thin baguette on an angle, about 1/2” thick. Brush each piece, using a pastry brush, with olive oil and then rub with garlic clove, before laying oil-side down on a cookie tray. Toast for 5-6 minutes, til golden brown. Meanwhile, chop up tomatoes (plum or roma work best) and basil. Toss together with balsamic vinegar, salt and pepper to taste. Once the bread comes out of the oven, top it with the tomato mixture. Lastly, I had lots of tomatoes and basil leftover, so I did what any cheese-lovin soul would do…. made Caprese salad! Again, very straightforward. Pile up round slices of tomatoes, with a piece of basil, and a round slice of fresh mozzarella. Fresh Mozz is a MUST! Once you pile up the stacks, drizzle them with balsamic vinegar and a little salt and pepper. Although I’m not really a big tomato fan, I just love the way this salad looks. Isn’t it beautiful? While these were appetizers, you could certainly make a dinner out of them. Had my friends not shown up with their goodies shortly after I finished assembling these, I think I might have! When I was in high school, I worked in a coffee shop alongside the Erie Canal. My favorite part of working there was the weekends when we’d whip up these delicious breakfasts including Belgian waffles and the yummiest frittatas. At the time, I didn’t eat asparagus (what was I thinking?) so I partook in the frittatas every other weekend when they featured broccoli. Last night I had roasted a bunch of asparagus for dinner, and had a good amount leftover, already cooked. I had a feeling that soggy asparagus wouldn’t be so delicious on day two and wondered what to do with it. Suddenly it hit me… Shannon’s Frittata! (Shannon was the name of the owner of the coffee shop, and appropriately, the name of the shop itself.) It’s been almost 10 years since I made that frittata and all I could picture was swirling loads of heavy cream into the egg mixture and layering cheese slice upon cheese slice. No wonder those frittatas were so scrumptious! I whipped up 3 eggs and 2 egg whites, and added about 3/4 cup of skim milk. Then I added a splash of half-and-half for some creaminess. I added the already cooked asparagus. If you were starting from scratch, just sauté them with a little bit of olive oil – this recipe will work with any veggies, and is a great way to use up leftovers. I poured the combo into a pie pan sprayed with olive oil cooking spray. To this, I added two slices of Swiss cheese that I tore into little pieces and sprinkled throughout. A heavy shake of pepper and we were ready to go! Into the oven at 350 F, the frittata cooked for 40 minutes. It’s done when the edges get a little bit brown and if you shake the pie tin, the eggs don’t wiggle too much. This dish will keep for days in the fridge, and you can just cut out a slice and reheat it in the microwave for about 30 seconds. I paired it up with a homemade latte for a delicious, filling breakfast! (Yes, it was homemade even though the cup looks otherwise… I have a habit of rinsing out and refilling my cups two or three times… until the cardboard starts to fall apart.) Yum! Stats from my favorite calorie counter, based on 3 egg + 2 egg whites, 3/4 cup skim milk, 1/4 cup half and half, 1 T olive oil (counted for my roasted asparagus earlier), and 2 oz swiss cheese. Not sure how much asparagus I used, it was about half of a grocery store “bunch”): 95 calories, 6 g fat (2.5 g sat), 6 g protein. My friend Jamie gave me an acorn squash from her neighbor’s garden, and it’s been making a lovely centerpiece on my fall-themed table for quite some time now. I’d googled a few recipes on how to cook it, and there seemed to be a few common themes: butter and brown sugar. 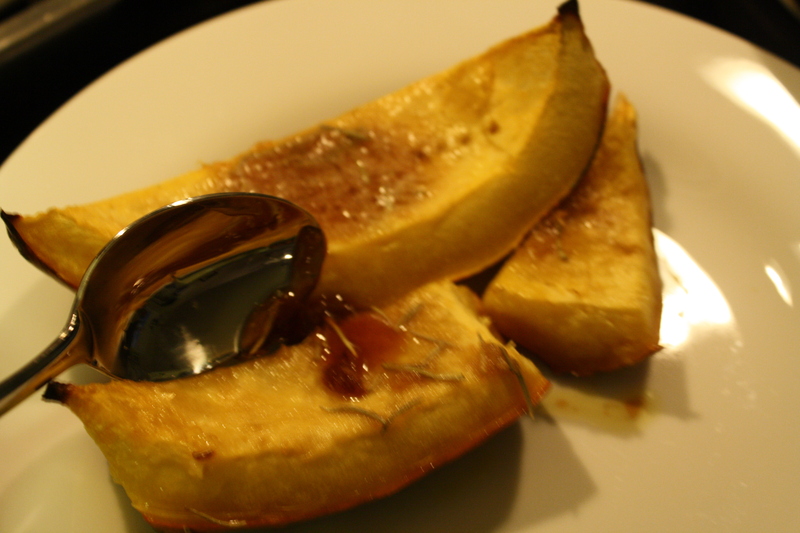 I’ve never eaten an acorn squash before, but I figured 171,000 Google hits can’t be wrong… butter and brown sugar it is. I KNOW. Hey, everything in moderation, my dear readers. 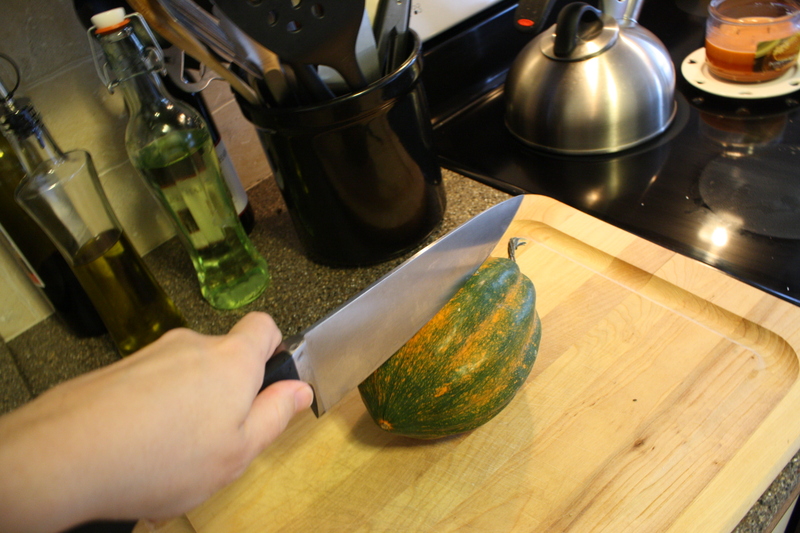 Then scoop out the inside, as if it were a pumpkin. I briefly considered saving the seeds to roast (and a google search later tells me you could do this), but decided to just focus on the task at hand. Next cut the acorn up into slices, like a melon. Arrange the slices in a baking dish, and drizzle with a little bit of olive oil. Roast in the pre-heated oven for 20 minutes. While it’s cooking, mash together 2 T butter and 1/4 cup of brown sugar. Try not to eat the concoction while you wait for the squash to roast. When they’re done, mash the paste on to each slice of squash and then stick it back in the oven for another 30 minutes. After 30 minutes, they should be done. You can stick a fork in one just to make sure they’re squishy. Before serving, scoop up some of the sauce that’s gathered in the pan and drizzle on top, just to really seal the deal. Drizzle the good stuff on there. This would obviously work as a side dish, but I actually had this as my dinner tonight. I paired it with a slice of Ezekiel bread with some marionberry jam (Thanks, Seattle-dwelling Jen!! ), and it was a delicious, if not a tad sweet, dinner. BUT, I’ve been fighting the urge to bust into the Halloween candy I bought today, so this hit the sweet spot cravings I’ve been having and was certainly a lot healthier. Very yummy, and now that I know what to do with acorn squash, I may be lurking around friends’ gardens more often. 2. 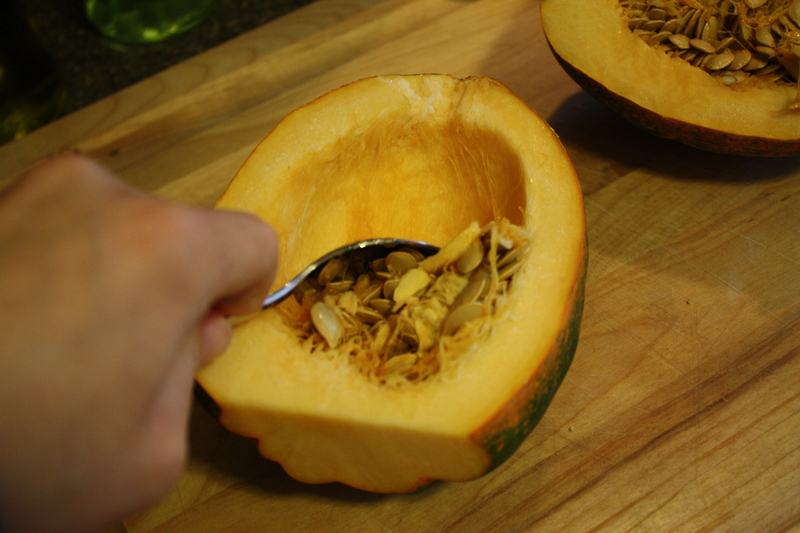 Half acorn squash, scoop out the insides, cut into slices. 3. Drizzle with 2 T olive oil. 4. Roast for 20 minutes. 5. Mix together 2 T softened butter and 1/4 cup brown sugar. 6. Rub on squash slices when they’re done roasting. 7. 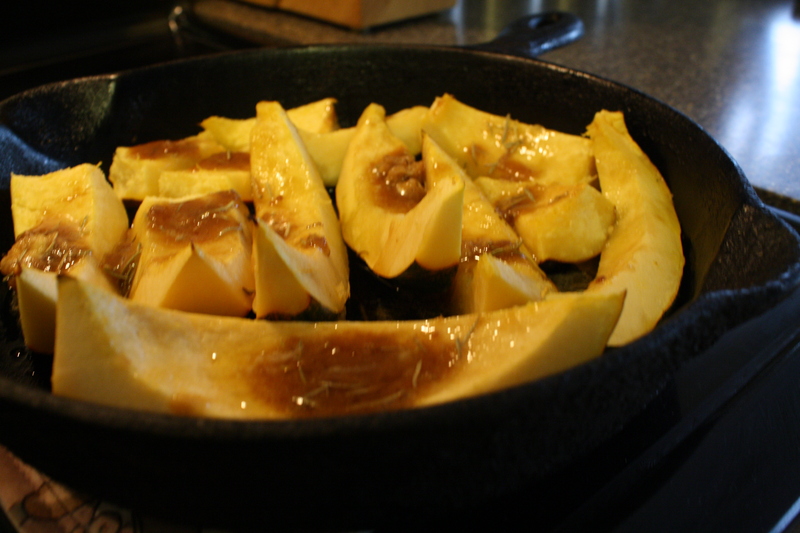 Put squash back into oven for 30 minutes, roast again. 8. Drizzle yummy goop from butter/sugar back on to slices, serve. According to my fave recipe analyzer, if you served 4 from this it’d be about 190 calories per serving. That actually surprises me – I would have thought it was a bit higher, taken into account all the butter and oil. But, youu can certainly find recipes that are a little heavier handed on the butter/sugar combo, and I thought my version had plenty of yummy goodness to drizzle on top. It definitely could be a great side dish for the holidays, or eaten as a main course like I did. Either way: deliciousness awaits you. As I’ve confessed, I like to rip off restaurant favorites and try to healthy them up a bit. One of my favorite meals here in town is a salad with fried goat cheese patties in it. Two places here serve it: 6th & Vine in downtown Winston and Riverburch Lodge. It’s a toss-up as to which one I like better. 6th and Vine might win solely because I usually eat it on their gorgeous back porch, and for better or worse, ambience is half my taste buds! Anyways, I figured “Fried” + “Cheese” were probably two things I shouldn’t go too crazy with BUT on the other hand, goat cheese is one of the lowest in calories and fats. A few months ago, my Everyday Food magazine featured a recipe on how to make them using panko and it was way easier than I imagined. I went to work and was so delighted with the results I had to share it. 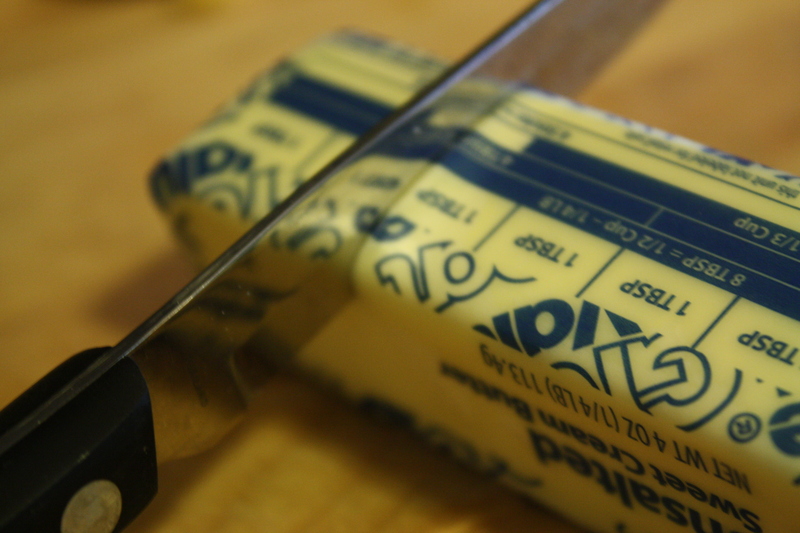 The key is to start with REALLY cold goat cheese, so it slices into nice disks. Then, you just drop each disc into a little bit of egg WHITE. After the egg white bath, they flip over to a bath of either panko crumbs or grind up a slice of WHOLE WHEAT bread. After that they can go into a pan with just some spray olive oil and abt 1 tsp of oil oil per little disc. They don’t take long to crisp up before you need to flip them. The stats will depend on how much olive oil you use, and how many discs you put on your salad per person. Here’s a quick way to tally it all up. I put three goat cheese discs on a salad with blueberries, a few chopped almonds, 1 T of olive oil and fresh ground pepper. It was words-fail-me delicious. Wednesday was supposed to be Chef’s Salad, but I ended up going to a Charity Chicks event last minute with some lovely ladies (skirtini’s for a cause, yes please) and I left Matt to his own devices with salad and sandwich basics. Thursday night, Matt was catching up on some sleep after a long shift at the hospital so we didn’t have a sit down dinner. A few years ago, my friend Emily brought a salad to our house for a cookout and every since then it has become a staple in our household. I could eat this morning, noon and night – I’m not kidding. And, it’s absurdly simple to make. Emily had a recipe, but after following it the few times, it started becoming a pantry-dump salad. If you’ve got 4th of July plans and need a healthy but yummy dish to take with you: here’s your dish! The general ingredients are beans, corns, tomatoes, onions and jalapenos if you like a little kick. Then the whole thing gets tossed together with 1/4 cup of olive oil or a light Italian dressing. I like olive oil with just a pinch of salt and lots of pepper, along with fresh garlic. The last one I made had kidney beans, black beans, corn, onions, tomatoes, and jalapenos. Based on these ingredients (one 15 oz can of each of the beans, 1 cup corn, 1 tomato) and the 1/4 c olive oil, it was 220 calories per serving. (My batch was 16 servings.) And it has 8 g of fiber AND 12 g of protein. We started making this as a side dish, but with those stats, I often eat it for lunch as my main entree!